You are 12 questions away from a stronger, more engaged workplace. 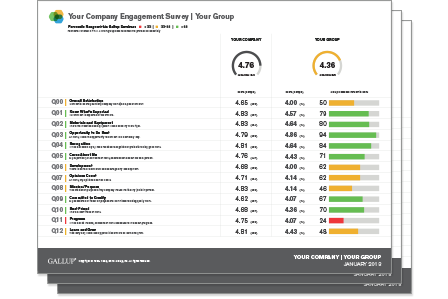 Why ask your employees dozens or hundreds of questions to measure their employee engagement if you can get the most accurate results by asking only 12? Gallup researchers spent decades writing and testing hundreds of questions, because their wording and order mean everything when it comes to accurately measuring engagement. Their research yielded Gallup's Q12 survey: the 12 questions that measure the most important elements of employee engagement. Gallup's Q12 survey is the most effective measure of employee engagement and its impact on the outcomes that matter most to your business. Employees answer 12 simple questions, available in over 30 languages including Arabic, Chinese, Spanish, French, German and more, that tie directly to performance outcomes. Scores are on a 1 to 5 scale, which clearly highlights strengths and opportunities. Click here to start using the only 12 questions that truly measure your employees' engagement. Jim Harter, Ph. D., author of New York Times bestseller 12: The Elements of Great Managing, talks about the power of Gallup's 12 questions. Don't spend countless hours trying to find out how engaged your employees are. Gallup offers a quick and easy way to set up, schedule, and conduct your Q12 employee survey online, along with a guide that includes actionable advice. After your employees complete the Q12 survey, you can use your results to quickly and easily identify areas of strength and opportunity, and begin to take action. Your survey results don't mean anything if you can't create measureable change. Gallup's Q12 survey results offer you power in numbers. Gallup maintains the world's most comprehensive employee engagement database of its kind and can directly link improved engagement, as measured by the Q12 survey, to increased financial performance. We pioneered the research behind employee engagement and continue to conduct groundbreaking studies. Read Gallup’s State of the American Workplace or State of the Global Workplace report to learn more about the relationship between employee engagement at work and organizational outcomes. The findings consistently show that the relationship between each element of engagement and performance at the workgroup level is sustainable and highly generalizable across organizations. That means no matter how you look at it, when your Q12 scores improve, the result is consistently better outcomes. Start managing employee engagement today and improve the outcomes that matter most to your organization. Watch this video to see how Gallup's Q12 survey correlates to performance on the outcomes that matter most to your organization.